The Reduced Tillage LINKAGES (RTL) program ended on August 31, 2009. All extension services such as the agronomists, Farmer to Farmer Network and e-newsletters have been discontinued. The partners have chosen to keep the web site online, given the value of the information in the Agronomy Library. The Library will not be updated and some links may not work. The RTL Agronomy Library contains hundreds of articles from getting started in direct seeding to fine tuning no till systems. 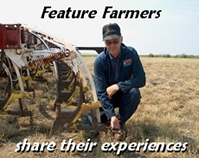 Topics include seeding equipment, residue management, weed control, crop rotations, soil quality and much more.